You won’t be on this page if you have nothing to do with a trumpet. When a trumpet is being played, it is easier to hear the sound because that is exactly what it’s designed to do. But do you know trumpets sounds differently? Yes, and that is because there are different types of trumpets. The trumpet is one of the best brass musical instruments that have its dynamism. It requires strength and skills to play which is why it takes time to become mastery of any type. The types of trumpets you are about to find out don’t just differ in tone or sound but as well in design, features, and finish. Most people do think cornet is also a trumpet, but it is not. It is just a brass instrument similar to that of a trumpet yet distinguished from it through its conical bore, shape, and tone. To create a quality sound with the cornet, players have to position their lips on the mouthpiece. The players have to press the lips to the mouthpiece firmly and blow air through the middle to make the instrument vibrate. To change the pitch of the instrument, the player has to adjust or alter the pressure from the lips to the mouthpiece. Every trumpet has its dynamism, and when it comes to cornet, it takes the lead when it comes to melody. 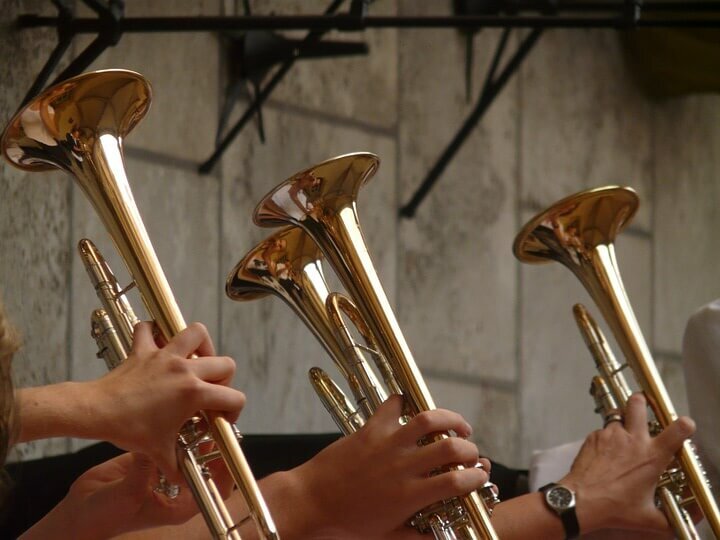 It is the best to use in Jazz bands, a military band, and traditional brass bands. Our suggestion for the cornet is the Ravel RCR102 Cornet Outfit. We didn’t just choose it from the bunch of cornets online but because it is the best-selling cornet on Amazon. The cornet is a product of Ravel and from reviews; we got to realize it is designed with all that is needed to make a trumpet player fulfilled. It comes with yellow brass, incorporating a nickel tuning slide and a mouthpiece. Also, it comes with a case in which you will find a synthetic oil to grease the valve and a polish cloth to clean and maintain the finish of the cornet. The common type of trumpet you will find online is the Bb trumpet. The truth remains that it is the most preferred trumpet to start with if you ever want to start a trumpet course. Most teachers’ advice their students to opt for a Bb trumpet because it is easier to learn and deal with. Bb trumpet has great sound and appearance. They are mostly tuned to B-flat and are easily used for all kind of performances. Bb trumpet has a warm tone with the ability to blend into the sound of larger groups. If you are in need of a trumpet to start with due to its simplicity and performance to enhance your training and rehearsal, the Bb trumpet is one of the best to consider. If you are ever interested in getting a Bb trumpet and yet not sure of the product to choose, the Jean Paul USA TR-330 Standard Student Trumpet is one of the best to consider. The trumpet falls in the key of Bb, and it comes with a robust contoured case which can be used to transport the trumpet from one place to another. The trumpet comes in a beautiful yellow brass body with Gold lacquer finish. Inside the case, you will find valve oil for valve lubrication, gloves for proper handling of the trumpet, cleaning cloth for maintenance, and a mouthpiece which is one of the important parts of the trumpet. The trumpet is very easy to use for players of different levels. It comes expensive but worth every value for its money. The next on the list is called the piccolo trumpet, and it is the smallest in the trumpet family. It is specially designed to deliver a B flat or an A tune. Apart from the fact that it is the smallest of the trumpet family, it is equipped with four valves instead of those that come with three. The trumpet has its functionality, and it is unique. It is perfect for orchestras and religious settings as a result of their capability to deliver G, F and C sound. If you are in turn to get a piccolo trumpet, the Sai Musical India Silver Nickel Piccolo Trumpet is the best option for you. It is the best-selling piccolo trumpet on Amazon. It is lightweight, portable and durable. It comes with an 84-month warranty to put the mind of the user at rest. It comes with a light case as well for the transportation of the trumpet from one place to another. You have in the case synthetic oil, mouthpiece, cleaning cloth and gloves. The Flugelhorn is one of the brass musical instruments that look similar to a cornet. The OSWAL Bb/F Silver Nickel 4 Valve Flugel Horn+W/Case+Mouthipiece is our recommendation on flugelhorn trumpet. It is one of the best to consider and the best-selling product on Amazon. Have you ever seen a valve-less trumpet? The bugle is one to consider. The trumpet is limited in tones because it has no valve. It is mostly found among the military. It isn’t a popular one which is why it is not common. Our recommendation for the bugle trumpet is the Regiment WI-800-BG Bugle. It is the best-selling bugle trumpet on Amazon. It has clear lacquered brass with detachable nickel plated mouthpiece. It can only play on key G with F slide. Apart from the list of the trumpets above, there are some others that you are likely to find in the market. We choose to contribute our quota by sharing with you the list of the types of trumpets you can consider with experts recommendations.